Sift the bread flour and the salt into a large bowl or bread maker. Create well in the centre, pour in the yeast mixture and eggs. Using a flat bladed knife to combine the mixture into a soft dough (mixture will be sticky). Knead for 5 minutes. Add the butter in three portions and knead for 15 minutes. Transfer dough to a greased bowl, cover with plastic wrap and let stand in a warm environment for 1 hour or until doubled in size. Knock back the dough and divide into four portions, place onto 4 squares of baking paper. Roll the four portions into 25cm diameter circles. 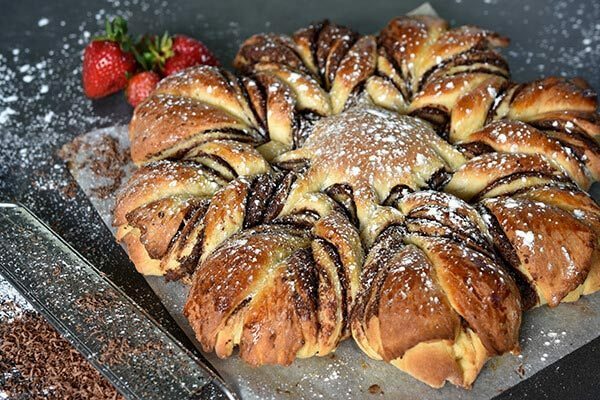 Spread the Nutella onto three of the circles, leaving a 2cm border. Sprinkle the dark chocolate onto the Nutella. Start with the plain circle on the bottom, place onto a baking tray. Flip the other three circles, chocolate side down, on top of the plain circle, removing the baking paper as you go. Place a round 5cm scone cutter in the centre of the circle (do not press down). Make 16 evenly spaced cuts from the scone cutter to the outside of the dough. Remove the scone cutter. Hold two strips of the dough and rotate twice outward. Press the ends together. Continue with the remaining strips. Loosely cover with greased plastic wrap. If you wish to cook the following day; place the dough star into the refrigerator. Set up and preheat your barbecue for baking. Please refer to your handbook for further information. Whilst the barbecue is preheating, make the egg wash. Combine the egg yolk and tablespoon of water. Using a pastry brush, carefully brush onto the bread. Once the barbecue has preheated, adjust the burner(s) to the baking setting. Place the bread on and bake for 20 to 25 minutes. Once cooked, remove from the barbecue. Finish with a dust with icing sugar.